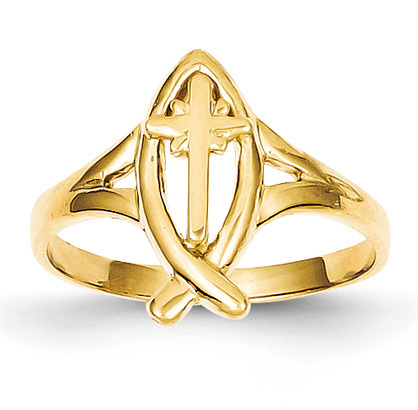 Ichthus cross ring crafted in 14k yellow gold. The Ichthus or Ichthys is from the Greek word meaning "fish". The fish symbol was a secret sign used between early Christians facing the threat persecution. Ring weighs approx. 1.89 grams of 14k gold. View our collection of quality Cross rings. "And it shall be for a sign unto thee upon thine hand, and for a memorial between thine eyes, that the LORD'S law may be in thy mouth: for with a strong hand hath the LORD brought thee out of Egypt" (Exodus 13:9). We guarantee our Ichthus Cross Ring, 14K Gold to be high quality, authentic jewelry, as described above.